I never gave much thought to using Rock Rose personally. Then I had a very challenging drama/trauma day. I was so taken by surprise, I didn't know what to do to find balance. Then I remembered Rock Rose and remembered Aromatics saying it's good for shocks and traumas. I added a few drops to my Transcend perfume, and I started settling down which is usually hard for me once I have had a shock. By the end of the day I felt so much better. Now, anytime that I am feeling a negative emotion, I look for ways to surround myself with this very lovely smelling, protective essential oil. 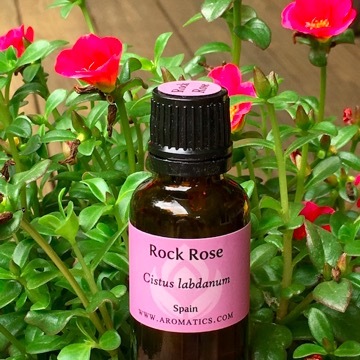 I love Rock Rose and find myself adding it to so many of my blends. And I keep a spritzer bottle of it by my bed to soothe away nightmares.